The Acer Aspire V3-771G-9809 Review, Comparisons and Charts. Compromises to arrive at a notebook with a gaming muscle to satisfy even the most demanding PC gamer while keeping the price down is what the Acer Aspire V3-771G-9808 is about. With a 17-inch display, it has one of the largest screens every gamer would like to have in a portable gaming platform, but it doesn’t waste hardware specs for full HD since Acer knows it would just add to the cost that won’t fully benefit gamers given its class 2 graphics engine. When the model was first released in mid-2012 and powered by the i7-3610QM, Acer advertised its V3 range as an “intense graphic gaming” with the “G” in the model designation representing its focus on graphics with the use of a dedicated NVidia GeForce GT 650M. Both CPU and GPU were new at the time the model was released and this V3-771G line can be said to be Acer’s first foray into the gaming laptop markets. Since then, it has not allowed its V3-771G line to slip into oblivion and it has made significant improvements on its features with a newer i7-3630QM quad core engine, the same GPU and a less than full-HD screen resolution to make it one of the best value gaming laptop below the $1000 price point. 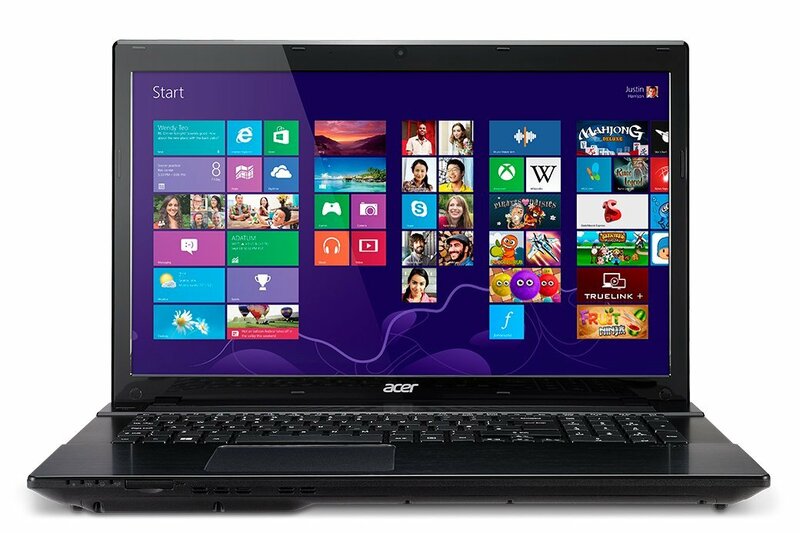 This Acer V3-771G is currently selling at Amazon for $966.99 undiscounted. It offers a practical gaming laptop thanks largely to Acer’s decision to use a higher category graphics engine and a non-full HD screen resolution, enabling it to play many of the most demanding games at medium to high game setting with most of them taking advantage of its default display resolution. The 17.3-inch LED backlit TFT TN (Twisted Nematic) screen sports an HD resolution of 1600 x 900, just one step lower than the 1920 x 1080 resolution in a full HD screen. Consequently, you can’t expect a high pixel density (it has 107dpi compared to 127dpi with full HD on the same screen size) nor will it have good color accuracy when viewed from a wider latitude as would get from the more expensive IPS (In Plane Switching) displays. But for gamers who sit straight in front of the monitor, this won’t matter much.. Even movies will not degrade substantially, especially when you consider that 42-inch plasma or LCD displays in HDTVs only provide 52 dpi pixel density. Brightness levels reach only a maximum of 230 cd/m2 while and contract ratio is 171:1. These figures are fairly average for most laptops. A 1TB SATA hard drive is getting to be the minimum storage capacity these days and some already offering 1.5TB. Multimedia files and Gaming apps will certainly benefit from this large storage capacity, unless you prefer to play games online. A speed of 5400 rpm is not state-of-the-art but this is one of the things can improve on at point of sale, with a hard drive running at 7200 rpm. And because it has a second drive bay, a solid state drive (SSD) which serious gamers will not want to miss in any gaming platform can be an option to further boost the performance of your games. Prices of hard disks capacity have decline and so too are SSDs on a per megabyte basis. But SSDs are still expensive, and a 120GB SSD can set you back by around $150. That’s already about twice the price of another 1TB laptop hard disk. The largest SSD capacity to date is 520 GB. But there is no doubt about SSD’s ability to significantly reduce data search and seek times when you have the game loaded in the SSD. On a hard disk, you notice this when your game goes to an entirely new screen or higher level and the hard disk whirls to load the texture data to paint a new screen. No such lags when using SSDs. It is interesting to note that the first Acer V3-771G had a 120GB SSD as standard specification but has since become an optional item in the current model. While the model is already more than a year old, the Acer Aspire V3-771G-9808 ups the computing power with the use of Intel’s 3rd generation i7-3630QM clocked at 2.4GHz with a 6 MB cache and supported by an 8GB DDR3 system RAM. The base clock speed may be low but due to its powerful Turbo mode, the cores can be overclocked to 3.4 GHz. Because of the relatively high thermal design power (TDP of 45 W / 55 W), this particular CPU is often used only in large laptops. 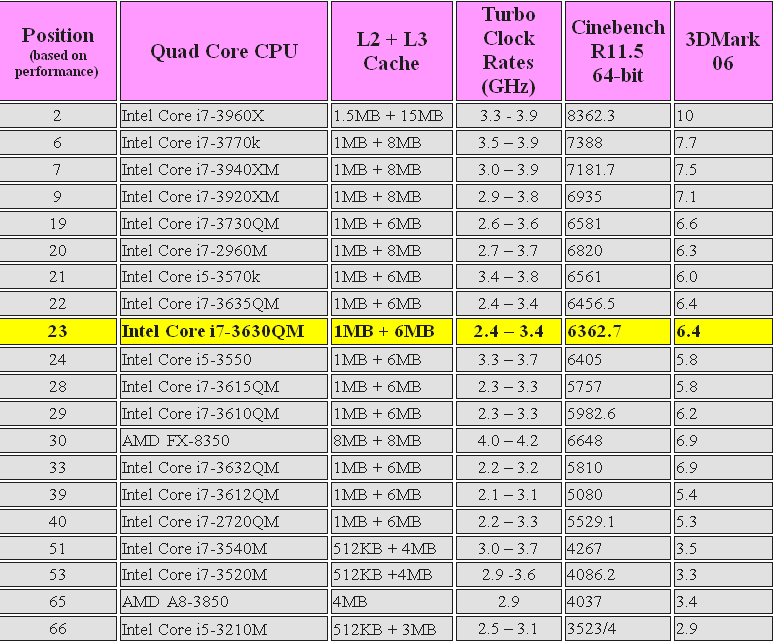 Table 1 below provides the relative performance ranking of quad core CPUs and the relative position of the i7-3630QM, a slight improvement over the original i7-3610QM used in the first release batches of the Aspire V3. 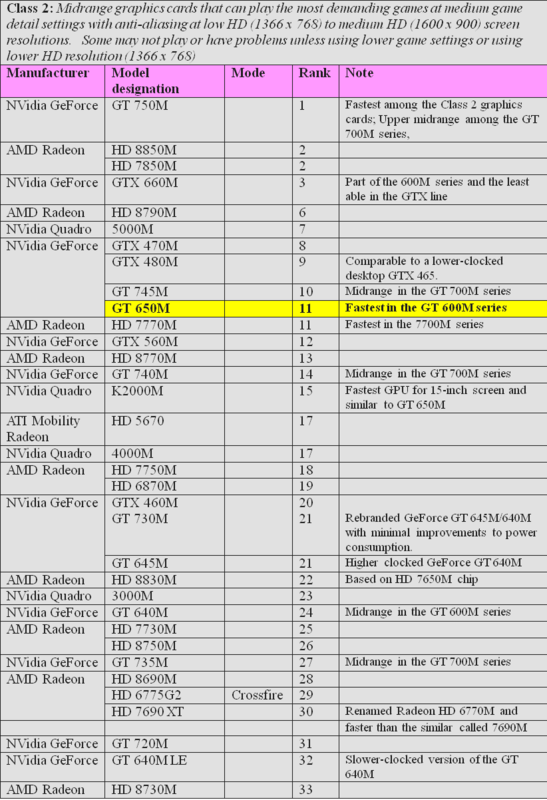 The NVIDIA GeForce GT 650M belongs in the class 2 category of upper mid-range, DirectX 11.1 compatible graphics cards and Table 2 below shows its high ranking among the class 2 graphics cards in the market today. This particular Kepler-based GPU manufactured in 28nm at TSMC was introduced in the first quarter of 2012 and Acer released it on what can be considered to be its first serious gaming laptop. The GeForce GT 650M is the fastest single graphics card in the GT 600M series and Table 3 shows its place among the rest of GPUs in that category. It uses a 128-Bit memory bus interface with either the cheaper and more commonly used but slower DDR3 for VRAM or the more expensive and faster GDDR5. Maximum VRAM is at 2 GB and the Asus V3 maximizes that capacity using a DDR3 memory. 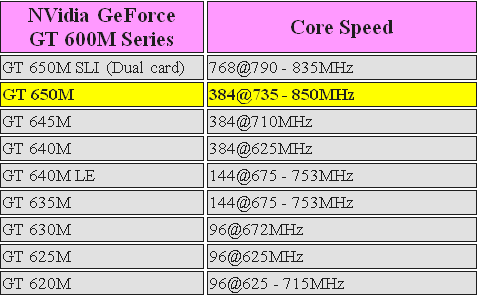 Due to a higher core clock speed from 735 up to 850 MHz the GT 650M is perceptibly more powerful than the more widely used GT 640M clocked at 625 MHz. Needless to say, using a GDDR5 memory type would provide a slight increase in performance. 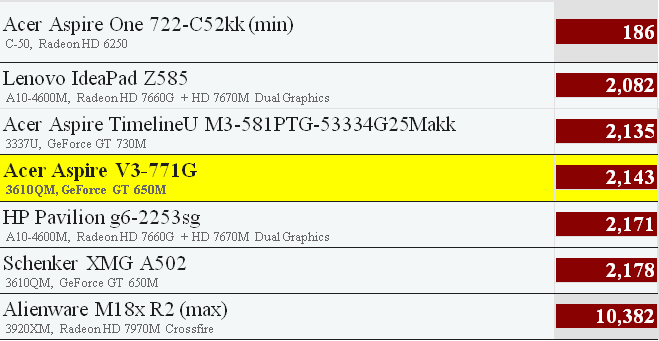 Table 5 shows the gaming performance of the Acer Aspire V3-771G-9808 based on the 3DMark 11 bench score. The top performing gaming laptop Alienware from Dell cost more than thrice that of the Aspire V3 specimen tested here. With the exception of the Aspire TimelineU M3 which is priced at $1310, all the others sharing about the same benchmarks have lower MSRPs because they are 15-inch laptops, except for the 18-inch Alienware. Measuring the ability to display seamless graphics is often used as the benchmark to say that laptop can be serious or casual gaming PC. Frame rates always establish what it means to have a rewarding gaming experience, and laptops that can play at least 30 frames per second qualifies as one that can seamlessly plat the title at the given game setting and screen resolution. . 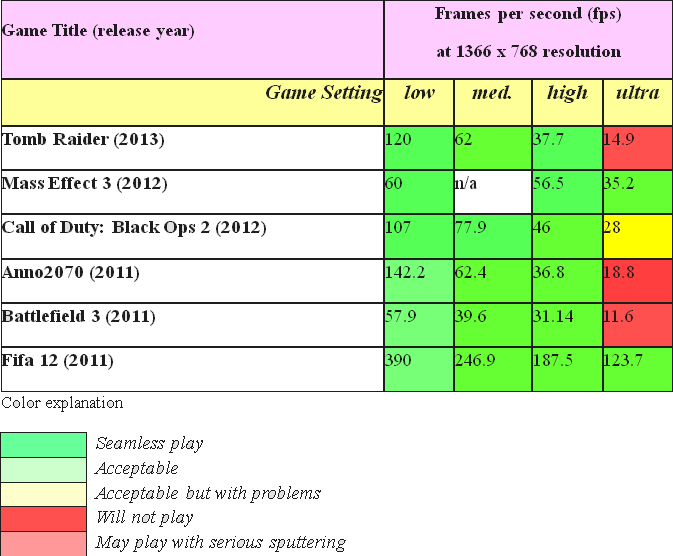 The frame rates shown on Table 5 used a screen resolution one step lower than the default HD resolution to check its ability to play at ultra high game settings that some demanding games have. But nearly all games released over the last three years will have no problem playing at medium to high game settings at the default HD resolution. Even with a slim 1.36-inch profile, this 7-lb Acer Aspire V3-771G-9808 will eventually strain your back when carried in a backpack over long distances. But this expected from laptops with a large screen that also carries a hard disk and an optical drive. Higher end laptops hover in the 10 lbs weight and are generally considered a portable PCs than laptops. Given its near-desktop performance, the Acer Aspire V3-771G-9808 is best used indoors. The one real annoyance is its glossy screen which at a brightness that is typical of most low end laptops, makes it difficult to use under direct sunlight or where there are lighted objects in front that can reflect on it. Typical with most laptops, the touchpad is best left alone for serious gamers who will find an external mouse a better alternative. The Acer Aspire V3-771G-9808 comes with 4 USB ports, two of which can support version 2.0 which is just fine to connect a USB mouse. Serious gamers who have known the advantages of using solid state drives in their desktops will always look for one in a laptop. Even a 120GB will do the job since they can easily a software-driven transfer of executable game files from the hard disk to the SSD to further speed up the screen texture re-draws when going into new game levels. It can be bummer that the Aspire V3 iteration for 2013 no longer has the SSD as standard gear. This is obviously meant to keep the price tag low. But the second drive bay is still there and users can opt to get one SSD later on. The Dolby Home Theater system may look great on paper, but those two tiny speakers can’t defy the laws of acoustic physics with it. You still get tiny bass-deficient sound from them. But that can easily be overcome with a hi-fi set of earphones or a more muscled set of external powered speakers. For the serious and casual gamer who wants a large screen to play games while on the go without breaking his bank, the Acer Aspire V3-771G-9808 fulfills the expectation competently while adding superb multimedia prowess on the side. If you don’t mind throttling down a resolution a bit for a few of the demanding games recently released, and can play under a shady tree or a friend’s house so as not to suffer the glossy screen’s reflections, this Acer Aspire V3 does the job well. And if you can add a few more dollars for an SSD, double the system RAM, there is no reason why you can’t have your desktop on the road with this baby. You can buy it at a very great price here. Acer once again gave us some good budget gaming laptop to work on.